I know that it has been rotting away for years, but the last photos I had of it were taken in 2002. Yesterday, I found much newer photos online. This aircraft was the second and last "real" McKinnon G-21C, serial no. 1202 ("real" because it was not a supposed simultaneous turbine conversion per STC SA1320WE as were all subsequent McKinnon "C" models.) It was converted from Grumman JRF-5 c/n B-78 in 1959 as N3459C. After originally serving the US Navy as BuNo. 37825, it was transferred to the US Coast Guard in 1952 and its serial number truncated to 7825. It was stationed at CGAF Barbers Point, Hawaii, until 1956 when it was sold to the Honolulu Department of Public Instruction and placed on the civil register as N5623V. McKinnon bought it in December 1957 and re-registered it as N3459C. The conversion into a McKinnon G-21C was started soon after the completion of the very first G-21C (N150M, s/n 1201) in December 1958. Prior to completion, N3459C was sold to the Everbrite Electric Sign Company of Milwaukee, WI on March 23, 1959, an Experimental certificate of airworthiness was issued on July 7, 1959 (which probably marked the end of the physical conversion process and the start of the flight testing phase), and then a final new Standard cetificate of airworthiness was issued on August 6, 1959 and it was delivered to Everbrite soon thereafter. In January 1967, McKinnon bought N3459C back from Everbrite Electric Signs and spent most of 1967 refurbishing it for a new customer - the Government of Pakistan. In September 1967, N3459C was de-registered in the US and registered in Pakistan as AP-AUY. It was flown to Pakistan that month via Gatwick Airport near London. In Paksitan, it was supposedly used as a sort of "Air Force One" executive transport for the President of Pakistan. After the civil war that resulted in the independence of East Paksitan and it becoming Bangladesh, AP-AUY was re-registered as S2-AAD - and it's been there ever since. Last edited by Rajay on Thu May 29, 2014 9:50 pm, edited 1 time in total. Last I heard & saw, it was to be exported back to the US, but that was several years ago. At least the center section is back on it and not laying in the dirt like it was before. I hope SOMEBODY saves it soon before it's too late. I've never seen any evidence that its center section was ever removed - at least not since 1967 or even 1959. Heck, over the years, I've seen very little evidence of its existence at all! As far as I'm concerned, the McKinnon model G-21C is one of the most misunderstood and mis-identified designs to ever be certified. * This particular example, serial no. 1202, as the only surviving actual piston-powererd G-21C in conformity to TC 4A24 Section I, is one of the most enigmatic Gooses that has ever existed. That's one of the reasons I'm running with every new lead I find or contact that I make. I've been trading e-mails now with the guy who took the profile shot of it that was recently posted on the Air Britain site (http://www.abpic.co.uk) for example. The photographer who posted the photo on the ABH site, Willem Ronge, told me that it was moved "recently" because they were making way for a construction of a new hangar and in the process of moving it, they cleaned a lot of debris and underbrush from in and around it. I too would very much like to see it find a new home where it would be more appreciated and possibly restored. It really takes a lot to permanently "kill" a Grumman (or in this case, an ex-Grumman) airframe - the anodized structure really stands up well to corrosion. I'd bet that in spite of how it appears in these photos, a few sessions with a soda blaster would make it look just marvelous! Oops Rajay, you're right, for some reason I thought it had been taken off the airplane. I did some digging and found the photos I have of it and the center section was on it then. I also have to agree about the exterior and a good cleaning, but I have to wonder about the condition of the interior fittings and extrusions. I hate seeing an airplane like that rotting away because the local government won't accept a lower than asking price, preferring to let the airplane disintegrate and getting nothing at all for it. Even IF it was sold I don't think it would ever fly again. Who in their right minds would want a 4 engine Goose ? Could it/should it be restored - YES ! Then park it in a museum for the world to admire (& ponder the fact that more is not always better). Personally I think it should go to the Evergreen Museum in McMinnville, Oregon. Then it would be just down the road from Sandy where it was built. I think it would be the perfect accompaniment to another wonderful, but equally & similarly flawed design, the Hughes H-4 Hercules (aka Spruce Goose). You know, I once contacted the Evergreen Museum to see if they had any biographical information about Angus G. McKinnon, figuring as you did that "since they were right down the road"* and as well that McKinnon was a significant "player" in Oregon aeronautical circles, etc. *except of course, it's a long road. Sandy is east of Portland toward Mt. Hood and McMinnville is southwest of Portland. After I explained to them who McKinnon was, they admitted that they had no idea and certainly had no material about him or his airplanes. I did just hear from a contact at Pen Air in Alaska that the Evergreen Museum recently bought the Grumman G-21A Goose "project" that Pen Air had for sale in Trade-A-Plane. That Goose is N7811, c/n B-122. And although I agree that it's not likely that anyone would actually want to operate a Goose powered by four 340 hp Lycoming GSO-480 engines, I do still think that it could be made airworthy again. They were built like tanks and I've seen many examples of aircraft in worse shape brought back, restored, and made airworthy again. It just requires a lot of time and money. I'm only a little surprised that the museum didn't know about Angus and McKinnon Enterprises. Some years back (93/94 ?) there was a Widgeon restored in Troutdale, Oregon just east of Portland and a lot of old McKinnon hands came out to help and brought in a load of old McK. photographs, memorabilia and documents. At the end of the project the remainders the stuff that had been donated was turned over to Don Dawson. From what I was told by the guy who owned the Widgeon there were several boxes of stuff that went North. I was misinformed about some of the information previously presented that cast a bad light on Don Dawson, I have been corrected on my assumption and offer a correction & this as a public apology to Don for the error. I agree, I can't see anyone wanting to fly the Goose in the current configuration again. But it should be restored and put on exhibit by someone somewhere - and SOON. They may be built like tanks and I too have seen wrecks in a lot worse shape brought back to life, but unless someone steps up and buys the thing it'll reach the point of being beyond financial feasibility. Even a cosmetic restoration is going to have to take care of a lot of corrosion and rust and as you well know that can add up to a LOT of money in a big hurry. Last edited by MrWidgeon on Tue Mar 19, 2013 3:12 am, edited 1 time in total. Is there somewhere I can read about the history of that aircraft ? Why 4 engines ? what was the benefit ? how was it certified ? I doubt an outter engine failure would go well without throttling back the other outter etc.. I can tell you just about anything that you'd ever want or need to know about any 'McKinnon' Goose. The design of the McKinnon model G-21C, of which this aircraft was the second and last 'true' or 'pure' example, was approved on November 7, 1958 (coincidentally my dad's 24th birthday - 3 years before I was born!) in conjunction with the initial approval of FAA type certificate no. 4A24. The very first G-21C, N150M (McKinnon s/n 1201) was converted from Grumman G-21A c/n 1147 (ex-British JRF-6B, RAF serial FP497) which was first operated after the war by the Fish & Wildlife Service of the US Dept. of the Interior in Alaska as NC709. McKinnon bought it from FWS and started to convert it in December 1957. This particular aircraft (s/n 1202) followed soon thereafter; more details of its history are already listed above. 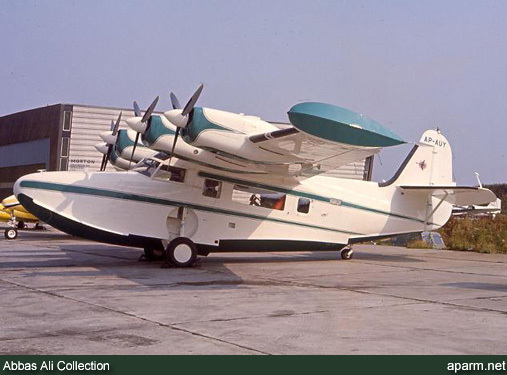 Beginning in 1953 or so, Angus McKinnon, a former building contractor from Sandy, Oregon, and a partner formed the McKinnon-Hickman Company and they started designing and installing mods on various Grumman seaplanes, first the Widgeon and later the Goose. McKinnon obtained numerous supplemental type certificates (STC) for both models and eventually converted something like 70 Grumman G-44 and G-44A Widgeons into what became known as 'McKinnon' Super Widgeons. Officially the Widgeons remained certified as 'Grumman' aircraft because they were only modified by means of the STCs. After he branched into the G-21 series of aircaft, McKinnon developed numerous other STCs, including a new 'radar' nose (made of fiberglass instead of sheet metal), a one-piece wrap-around windshield, retractable wingtip floats, auxiliary fuel tanks, electrically-retracted landing gear (to supplement the hand crank), and many other individual mods. The 'problem' came when he wanted to install all of those various individual mods together on a single aircraft; the FAA said that the changes were so comprehensive that in addition to the four-engine conversion, the result was essentially a new aircraft and they 'approved' it as a new model G-21C under a new type certificate (4A24) - instead of being just modified Grumman G-21A Gooses with McKinnon STCs installed, McKinnon was allowed to "zero-time" each of the aircraft so thoroughly converted and call them new 'McKinnon' Gooses. The four 340 hp Lycoming GSO-480-B2D6 piston engines (GSO = Geared, Supercharged, Opposed - i.e. a horizontally opposed cylinder arrangement, aka 'flat' engines with 480 cubic inches displacement) were used because of his impression that the original radial R-985 engines (450 hp each) were getting old and less reliable - and that they never really regularly developed their full 450 hp. No other piston engines of the same nominal power rating were available at the time that could be swapped 'one for one' and so McKinnon chose to use four engines instead of two to bump up the total horsepower from 900 to 1,360. Along with the increased horsepower, he also made a lot of not-so-visible structural reinforcements to the Goose airframe and together those changes allowed him to raise the max gross take-off weight of the 'new' model G-21C from only 8,000 lbs (for a basic Grumman G-21A) all the way up to the single-pilot, "Small' aircraft limit of 12,500 lbs imposed by the FAA. *And the McKinnon model G-21D was literally just a G-21C (N150M, s/n 1201) that was later further modified to get a 36 inch extension installed in its nose section along with four additional passenger seats and two more windows on each side of that longer nose - after which it was re-certified as another 'new' model and given another new serial number, 1251. After he got involved with the turbine conversions, McKinnon "never looked back" as they say, and never again converted a Goose to the configuration in these photos. Because its 'sister' ship (N150M; G-21C s/n 1201) was later converted into a G-21D (in 1960) and even later converted to turbine power per STC SA1320WE (in 1965-1966) into a configuration that McKinnon called a "Hybrid" (because it was heavily modified by means of an STC), this aircraft, S2-AAD (McKinnon G-21C s/n 1202) represents the very last of its kind - and that makes it a very rare bird indeed. Thanks, Rajay, I couldn't have said it better myself (really, I couldn't have, that was Waaaaay beyond what I knew about it- LOL). Thanks Rajay, you are always very precise, this is an interesting development, I am amazed at the number of modifications made to that aircraft, it must have cost them a fortune to get these mods approved. I am still puzzled by the fact that the 4 engines mod was approved however is doesn't seem that the rudder area was increased, I am doubtfull that the Vmc speeds would still meet the certification criterias, when I have some time I'll try to compute Vmca just to have an idea for both 2 eng radial and 4 engines..
thanks again for the detailled answer, sorry I didn't saw it earlier I think my email notifications must be disabled..